Psalms 16:11 Thou wilt show me the path of life: in thy presence is fullness of joy; at thy right hand there are pleasures forevermore. A journey of 1,000 miles begins with one step…at least that’s what one unknown traveler said. But, with all due respect, he was wrong. Even the AAA Motor Club will tell you that a journey of any length first begins with a plan. Now, I am not talking about a journey to Toledo, Ohio (not that there would be anything wrong with that), but rather one that begins in the finite and ends in the infinite; a journey that begins in the earthly and ends in the heavenly. This plan begins to focus when one sees that the scope and design of the whole Bible is Jesus Christ. As simple as this may sound, many of today’s prophecy teachers miss this point and spend their time speculating about the identity of a future one-world tyrannical “antichrist,” about whom the Bible speaks nothing, instead of focusing on the inerrancy of the One to whom there is no question of prophetic legitimacy—Jesus Christ. Jesus is God’s plan. He is the One whose testimony is the spirit of prophecy (See Revelation 9:10), and the one to whom we must look to properly interpret the prophecies found within the pages of our Bible (See John 14:6; Hebrews 1:2, 12:2). Jesus said, “Search the Scriptures; for in them ye think ye have eternal life: and they are they which testify of me.” (John 5:39) Paul similarly agreed with this when he said, “Wherefore the law was our schoolmaster to bring us unto Christ, that we might be justified by faith.” (Galatians 3:24) As we read through the pages of our Bibles, we see that from Genesis to Revelation, the Bible speaks about one master plan, of which Jesus was the focus. He was first mentioned in Genesis 3:15 when God said, “And I will put enmity between thee [satan] and the woman, and between thy seed and her seed; it shall bruise thy [satan’s] head, and thou shalt bruise his [Jesus’] heel.” This is, of course, the first promise recorded in our Bibles of Jesus coming as the Savior for mankind. This promise was made at the time of Adam’s fall, and was given as an assurance from God that mankind would someday receive from Him a spiritual reconciliation. This same promise is subsequently mentioned in different ways throughout the Old Testament. The good news is we do not have to wait for this reconciliation to arrive. The Apostle Peter believed this was true because he said he believed Jesus has NOW fulfilled these same promises. (18) But those things, which God before had shewed by the mouth of all his prophets, that Christ should suffer, he hath so fulfilled. (19) Repent ye therefore, and be converted, that your sins may be blotted out, when the times of refreshing shall come from the presence of the Lord; (20) And he shall send Jesus Christ, which before was preached unto you: (21) Whom the heaven must receive until the times of restitution of all things, which God hath spoken by the mouth of all his holy prophets since the world began. (22) For Moses truly said unto the fathers, A prophet shall the Lord your God raise up unto you of your brethren, like unto me; him shall ye hear in all things whatsoever he shall say unto you. (23) And it shall come to pass, that every soul, which will not hear that prophet, shall be destroyed from among the people. (24) Yea, and all the prophets from Samuel and those that follow after, as many as have spoken, have likewise foretold of these days. (25) Ye are the children of the prophets, and of the covenant which God made with our fathers, saying unto Abraham, And in thy seed shall all the kindreds of the earth be blessed. (26) Unto you first God, having raised up his Son Jesus, sent him to bless you, in turning away every one of you from his iniquities. (9) Receiving the end of your faith, even the salvation of your souls. (10) Of which salvation the prophets have enquired and searched diligently, who prophesied of the grace that should come unto you: (11) Searching what, or what manner of time the Spirit of Christ which was in them did signify, when it testified beforehand the sufferings of Christ, and the glory that should follow. Jesus was the plan that God made before the foundation of the world: (Revelation 13:8) Angels announced His coming (Matthew 1:20-25; Luke 1:26-38), a virgin brought Him into this world (Luke 1:26-35), Shepherds were called to His birth (Luke 2:8-17), the Magi came to pay Him homage (Matthew 2:1-12), Simeon and Anna prayed to see His salvation’s arrival (Luke 2:22-38), John the Baptist prepared His way (Matthew 3; Mark 1:1-11; Luke 3:1-23; John 1:19-34), the cross became His plan for the redemption of mankind (Matthew 27:35-38; Mark 15:25-28; Luke 23:33-38; John 19:18-24; Revelation 13:8), an empty tomb was His assurance of His reigning power in heaven and in earth (Matthew 28:5, 6; Mark 16:4-6; Luke 24:1-6; John 20:6-17), the outpouring of His Holy Ghost on Pentecost was the reuniting of His Spirit with man’s (Acts 1:4-8, Acts 2:1-40; John 14:17; Romans 8:9), and on and on are the evidences found throughout the New Testament that Jesus was the One who came to fulfill all the redemptive promises found in the Bible. Because of His success, there is now a way made available to man whereby the sin-nature he was born with can be destroyed. This takes place through the new man, who is created by being born again in Jesus. This rebirth reunites man to the relationship he once had with his Creator in the Garden of Eden and places him into the New Covenant of Jesus Christ. (15) While he yet spake, behold, a bright cloud overshadowed them: and behold a voice out of the cloud, which said, This is my beloved Son, in whom I am well pleased; hear ye him. To the Jewish mind these words meant something more than just a heavenly exchange between God and man, for found within this proclamation are three snippets of scripture that reference the three divisions of the Old Testament—the Prophets, the Law, and the Psalms. As the voice of God spoke at this meeting, the apostles were literally looking at Elijah (who represented the prophets), Moses (who represented the Law), and Jesus (who was the heir to the throne of the Psalmist King David). The first of these is when this voice said, “My Son.” This statement was referring to a Messianic prophecy found in the Psalms and was applied to Jesus in Acts. (7) I will declare the decree: the LORD hath said unto me, Thou art my Son; this day have I begotten thee. (33) God hath fulfilled the same unto us their children, in that he hath raised up Jesus again; as it is also written in the second psalm, Thou art my Son, this day have I begotten thee. Similarly, “Well pleased,” was referencing Jesus as He is described by the Prophets and was applied to Jesus in Matthew. (1) Behold my servant, whom I uphold; mine elect, in whom my soul delighteth [well pleased]; I have put my spirit upon him: he shall bring forth judgment to the Gentiles. The command to “Listen to Him,” was spoken by the Law giver, Moses. In Acts, Luke wrote that this command is to be applied to Jesus Christ. (37) This is that Moses, which said unto the children of Israel, A prophet shall the Lord your God raise up unto you of your brethren, like unto me; him shall ye hear. Darby’s translation of the Bible for this passage uses the word “consummated” in place of “finished.” According to Webster’s Dictionary the word “consummated” means, “Completed; perfected; ended.” These words are consistent with the view that Jesus sealed up, or made an end to, the visions and the prophecies that foretold of His coming. Jesus’ sacrifice was the plan that made a way for all men to live again in fellowship with God, and fulfilled the promise in the Garden of Eden, as well as those God made to Abraham. (Genesis 17:4, 5; Romans 4:17, 18) God said He was going to make that old man of faith, a father of many nations. “Nations” is the Hebrew word “Goy.” Strong’s says this is a “foreign nation; hence a Gentile, heathen, nation, people.” (Strong’s H1471) This is what Jesus’ sealing of the vision and the prophecy did; it allowed access to the Kingdom of God for the Jews (Acts 2), the Samaritans (Acts 8), and to the Gentiles (Acts 10). Even though this command to teach non-Jewish Gentile people is very clear, the Apostles at first only went to those we would call Jews. Why would these Holy Ghost led men ignore such a clear command of Jesus? Could it be that they did not disobey, but rather they understood that Jesus wasn’t saying find “non-Jews,” but was saying, “ALL peoples are NON-CITIZENS of MY KINGDOM if they aren’t BORN AGAIN?” I think the answer to this is clear, especially when you remember that those who are born again are called “new creatures in Christ.” They are called this because they are not named after a tribe or a nationality but after the name that is above every name—Jesus Christ! So in essence, by reason of their new birth in Jesus, they have become a new indescribable creation! (17) Therefore if any man be in Christ [the focus of the prophecy and the vision of the Bible (See Daniel 9:24)], he is a new creature [born from Jesus]: old things are passed away [sinful Adamic nature]; behold, all things are become new [Christ’s spirit-led nature]. (15) For in Christ Jesus neither circumcision [Jew] availeth any thing, nor uncircumcision [Gentile], but a new creature. Also, this same body of believers—Jew, Samaritan, and Gentile—are called a “holy nation.” (1 Peter 2:9) Such a description implies that through Jesus, they have become a set-aside dynamic new people. (9) But ye are a chosen generation, a royal priesthood, a holy nation, a peculiar people; that ye should show forth the praises of him who hath called you out of darkness into his marvelous light: (10) Which in time past were not a people, but are now the people of God: which had not obtained mercy, but now have obtained mercy. (26) Even THE MYSTERY which hath been hid from ages and from generations, but now is made manifest to his saints: (27) To whom God would make known what is the riches of the glory of THIS MYSTERY AMONG THE GENTILES; WHICH IS CHRIST IN YOU, the hope of glory: (28) Whom we preach, warning every man, and teaching every man in all wisdom; that we may present EVERY MAN PERFECT IN CHRIST JESUS: (29) Whereunto I also labor, striving according to his working, which worketh in me mightily. Jesus’ coming showed men the plan they needed to know so they could step out by faith to begin their journey toward their final reward. This is this same plan—Gospel—that the Apostles taught. (22) Having therefore obtained help of God, I continue unto this day, witnessing both to small and great, saying none other things than those which the prophets and Moses did say should come: (23) That Christ should suffer, and that he should be the first that should rise from the dead, and should show light unto the people, [Jews] and to the Gentiles. Jesus said there is only one plan. He is the creator of all things including religious exclusiveness. He laid claim to being the only way to successfully lead your life in this world and the only way to make it into the next! Some may think God’s plan was motivated by a jealous lust for power or by a conceited drive to gain attention, but neither is true. God made His plan available not to help His own self, but to help those He loves; this includes all peoples of the world including you and me! (16) For God so loved the world, that he gave his only begotten Son, that whosoever believeth in him should not perish, but have everlasting life. (17) For God sent not his Son into the world to condemn the world; but that the world through him might be saved. (18) He that believeth on him is not condemned: but he that believeth not is condemned already, because he hath not believed in the name of the only begotten Son of God. The first step of your life’s journey can begin today, but first you must see that the plan God has for your life has always been Jesus! He is the One from whom all blessings flow, and the One by whom and for whom all things were created. (James 1:17; Colossians 1:16) When a person sees that Jesus is their PLAN, then they can also see their purpose and worth in the world they live in. See, you don’t need a GPS to give you the right direction for you life; you need the Word of God. If a person will take God’s Word and live it according to what is found in its pages, they will find the new and living way that brings contentment to their life. No wonder Paul said, “For the kingdom of God is not meat and drink [obedience to the Law]; but righteousness, [what Jesus’ sacrifice brings to man] and peace. [confidence that comes from following His plan] and joy, [the unshakable emotion that accompanies our walk] in the Holy Ghost [the power we experience along our journey as we stay focused on the plan of God].” Remember, your life’s plan always was, is, and forever will be, Jesus Christ in you, the hope of glory! 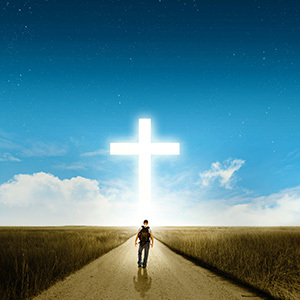 (See Romans 14:17; Colossians 1:27) As we walk in Jesus, we will easily find the direction to our eternal home, because the steps of a good man are always ordered of the Lord. (See Romans 8:1; Psalms 37:23) May Jesus bless us as we journey home! Copyright © 2003 TK Burk. All Rights Reserved. Prev Whose God is Their Belly?